When we think of international marketing, we often think of shipping, transatlantic package rates, brick and mortar transactions, different languages, and so on. We might also think of faraway places, unreachable unless you run a large, multinational business. With the World Wide Web, of course, the world has become attainable. From anywhere in the world, you can reach… anywhere in the world. Middle American small business owners rub proverbial shoulders with middle-weights in the Sahara and heavy-weights in the way-down-unders of Australia. Just because you can reach somewhere, doesn’t mean you can actually sell to that place, however. Reaching is easy. Marketing is a whole other animal. At its simplest level, international marketing involves making one or more marketing mix decisions across national boundaries. At its most complex level, it involves establishing manufacturing facilities overseas and coordinating marketing strategies across the globe. Online marketing to an international audience falls somewhere in the middle, but it, too, has levels of complexity. Marketing across national boundaries in a physical world requires things such as knowledge of tariffs for individual countries, or which country requires what type of postage. Online, international marketing also has its set of rules. The UK, however, has particular rules for any marketing that may reach children. An excellent example is the Advertising Standards Authority (ASA) and the Committee of Advertising Practice (CAP) ruling of a mobile application. The AVG Cleaner app–not a problematic application in and of itself–showed a banner ad for a solitaire game. The ad featured suggestively posed women in bikinis. While the ASA ruling was more of a warning than a major fine, it points to the seriousness of making sure your I’s are dotted and T’s crossed if you want to market to the U.K.
One of the common issues we run into with clients who have started international campaigns is understanding the differences in languages. Many believe that just targeting the main language of a country is enough. In some cases, this is true. In others, it’s far off. The “Chinese language” is an excellent example. There are actually 5 main dialects spoken in the country; many are mutually unintelligible. “Spoken Chinese is separated into five main dialectical groups, of which Mandarin is only one. Yue (which includes Cantonese), Min, Wu and Hakka make up the other four, covering more than 200 individual dialects. Some of these dialects are limited to very small geographical areas, while others have speakers all across the country and beyond.” – What Are the Different Types of Spoken Chinese? “Culture” is loosely defined as “the way we do things around here.” It’s taught, whether on a national, community or business level. It includes everything we’ve learned: all of our values, rituals, traditions and customs, among others. Since these things vary depending on where you live, it’s important to understand the culture of the locale you’re targeting. For example, November 11th of every year, young Chinese people celebrate Singles’ Day. What does that have to do with marketing? Let’s look at what Forbes had to say about Singles’ Day 2016. “Alibaba Group just wrapped up its annual November 11 Global Shopping Festival (Singles’ Day sale). What was already the world’s largest 24-hour online sale became even bigger. This year, Singles’ Day rang up an eye-popping $17.8 billion in sales, up from $14.3 billion last year. As an international marketer with China as a target, knowing about this very lucrative holiday could make your bottom line swell appreciatively. Stanford Business has an excellent article about culture in advertising and how it colors the way we buy. Educational “norms” don’t exist nationally. Requirements vary widely from nation to nation, and that may affect how you market to the nation. For example, South Sudan has a literacy level of 27%. Somalia has a 37.8%. On the other hand, the U.S. has an 43% literacy rate, while Russia tops the chars with 53%. Countries with lower literacy rates may be better candidates for visual or audio ads. Countries with higher literacy rates may be the best places for successful content marketing campaigns. As you can no doubt guess, creating an international marketing strategy can get complex easily. That doesn’t mean it’s impossible, however. 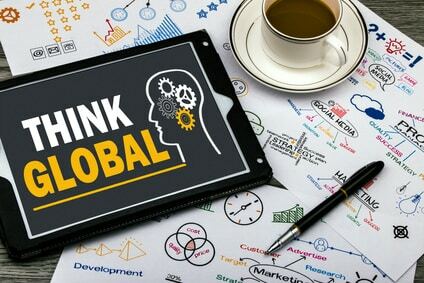 When clients come to us because they’re going global, we create the strategies to fit their target market–much like you would in any marketing campaign. The difference is in the number of questions you ask and how deep you look. For instance, if we’re creating an international marketing strategy for a client, we might have to research the customs and business etiquette of the target country. After all, although we’re in several countries, we’re not in all 196. Second, we’ll have to find out what the marketing rules are for that particular country. The last thing we want to do is get a client in trouble because of some jurisdictional legalese. Third, we want to look at the competition. What did they do to break into the target area? Or did they try and fail? Ultimately, we want to figure out what we can do differently to ensure success. Can You Afford to Expand? With our technology, there’s absolutely no reason a business has to stay in a single location unless they want to. However, branching out is something that takes serious consideration. It’s not to be taken lightly. Is your company ready for the increased exposure? Can you potentially handle double the sales? We have a service client that asked us to stop the majority of our campaign because they got too much work. They’re still booked three and four months in advance. Are you prepared to handle shipping costs and international currency? You need to be aware that your target market will most likely not have the same currency as you. How will you deal with the difference in coin? How will you manage the fees of exchange? Will you charge the customer or yourself? Are you prepared for a larger marketing budget? Pushing out into international waters is not the same as creating a campaign on the home front. If you’re struggling to keep your national campaigns going, it’s not the time to reach out to the world. International marketing has its benefits, an expanded customer pool being one of them. Successful campaigns are very possible, but you have to be prepared. In fact, research and preparation are the two most important parts of any international business endeavor. Thoroughly research your expansion market, thoroughly prepare your company, and then jump in with both feet, chocolate in one hand, wine in the other and a wahoo! on your lips!